Here's are two botanical items that go together in an interesting way. What do we have here? Let's see if anyone out there can identify the plants, which means they know what this is and what it is for. What do you say sports fans? 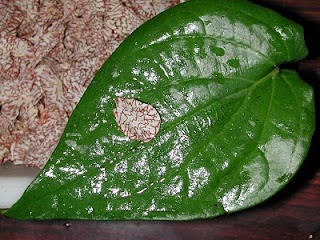 the betel nut leaf and the areca nut. btw what does it have to do with sports fans? The leaf is from the betel piper, a close relative of black piper (pepper). And the slice of ruminate endosperm is from the seed of the betel palm (areca). The latter is wrapped in the former and smeared with a bit of slacked lime and then chewed. This treat is called paan and it aids digestion while giving the chewer a mild buzz. Paan is an acquired taste. Pretty common in Manchester in the cold and rainy north of England, as well. That cross-section through the nut is unmistakeable. Most paan has spices, fruit and other stuff, even tobacco at times, added for flavour.